About a week and a half ago I made the quick, irrational decision to start a diet. I do not know what inspired me to do it besides the encouragement of a friend (because he’s doing the same thing), or what… but I am about to give up. Before I give up, though, I am renaming my diet. First I was calling it the “Rebecca Is Going to Lose 10 Pounds by Fest” diet, but now I will simply call it the “Vegetables & Sadness” diet. I am by no means depriving myself of food, but I am forcing myself to eat more vegetables. It was a moment of rejoicing when I ate a mini pepper on Saturday and did not spit it out into the sink. It’s just the start of all the vegetable eating I will do. Maybe this is part of adulthood, forcing myself to eat vegetables in order to be healthier. This was something I told my mom and she said,”Your father will never be an adult then.” and I felt somewhat bad. Whoops. Because I am calorie counting and tracking literally everything I do, my brain is under the impression that I must be starving myself. 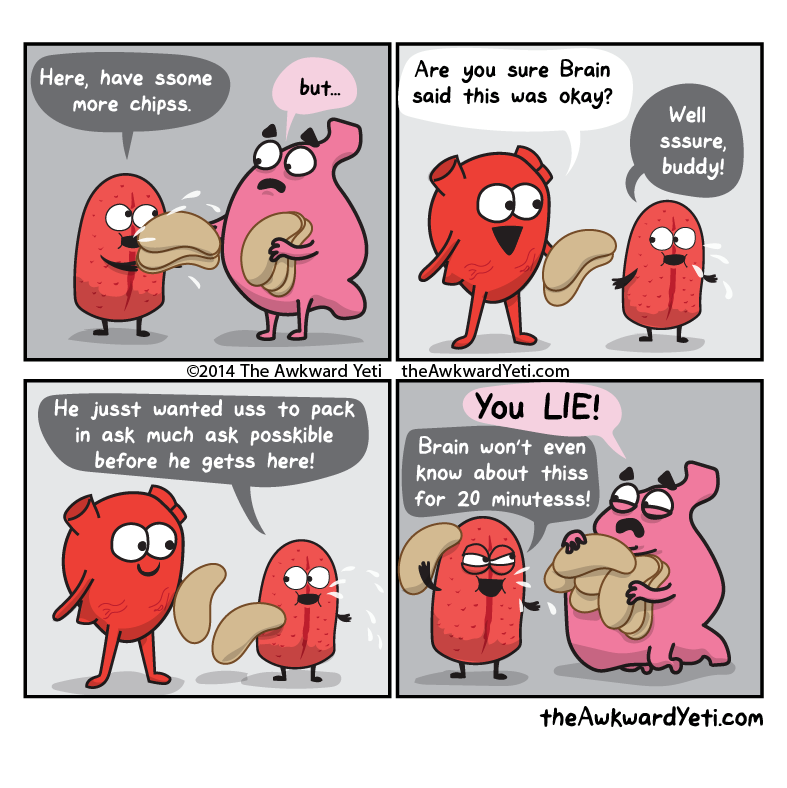 I feel like one of those comic strips that The Awkward Yeti puts out on a regular basis. And that is basically how I feel about that. See you all Saturday with my first book review!